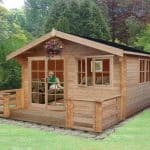 This large rectangular log cabin is very attractive and incredibly versatile. 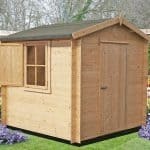 It not only has lots of space inside, which we feel makes it perfect for either leisure or business purposes, it also has a large overhanging roof. 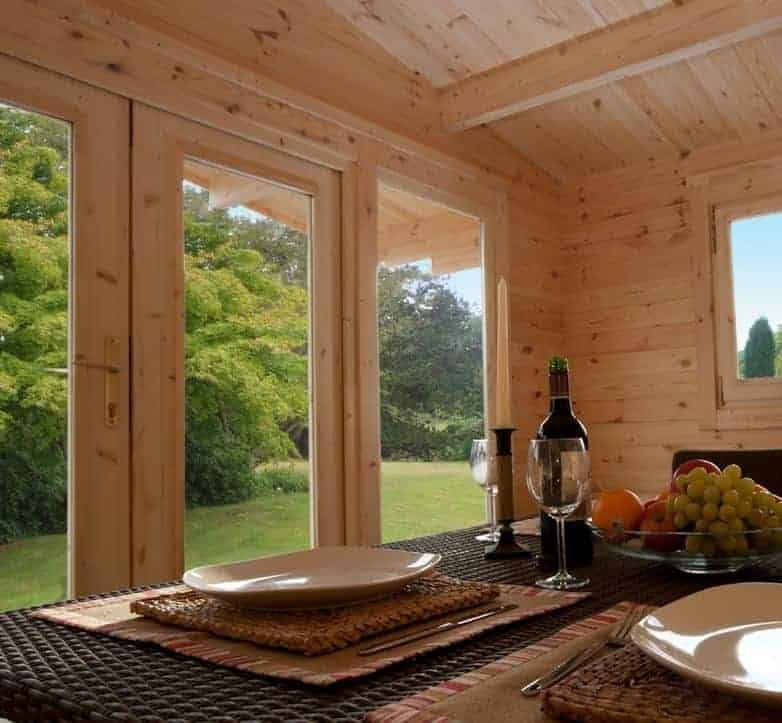 This creates a porch area that’s protected from the elements, making it ideal for a barbecue or a place to entertain guests as you look out at the garden. Weather protection is a quality that we found repeated throughout the building. The first indication of this is the tall and strong apex roof which means that water simply bounces off it or is carried harmlessly away. The wall cladding, which we were pleased to see has been given a long lasting pressure treatment, is also very water resistant as it’s made of thicker than average Nordic Spruce logs that lock tightly together and thus prevent water penetration. This means that you’ll have a reliably dry interior, and it stays warm for longer too thanks to the double glazing used on the three windows. We were glad to see that the windows can also be opened, to allow ventilation whenever required and to allow cooling fresh air to reach the interior on a hot day. Whilst this isn’t one of the largest log cabins we’ve reviewed, there’s still enough room inside to make it suitable for a wide range of purposes. 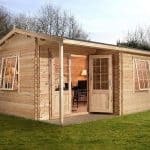 It could easily be used as a home office for people who are starting their own business, or alternatively it could be used as a home extension with the introduction of a bed or furniture, or even something more fun such as a snooker table or gym equipment. One thing that really stood out for us was the overhanging roof. It projects for 1.20m and creates a large area in front of the cabin itself that’s protected from rain. This can be used for anything from a log store to a patio set for entertaining. The felt covered roof is also tall, creating a ridge height of 2.54m with an eaves height of 2.14m. 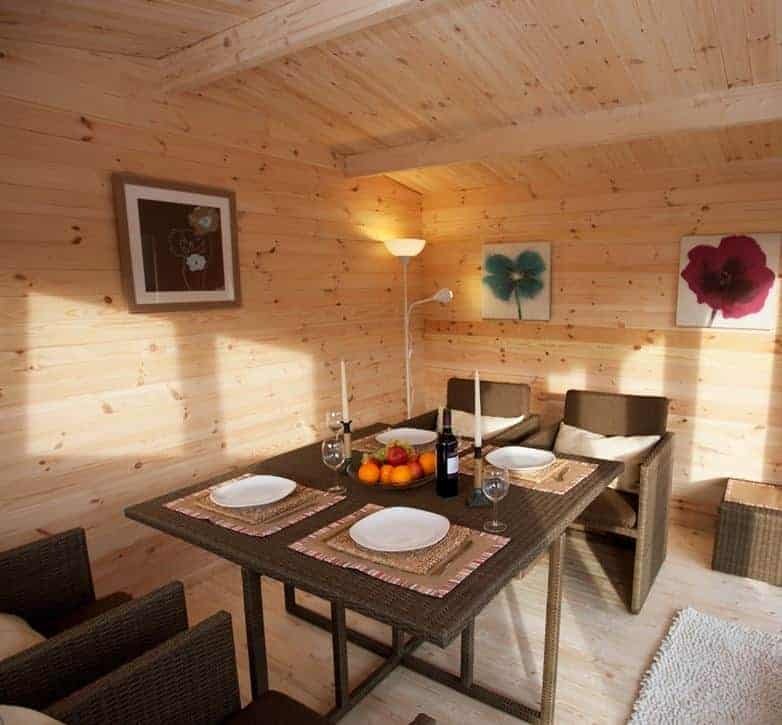 The overall width of the log cabin is 4.00m and the depth not including the overhang is 3.00m. 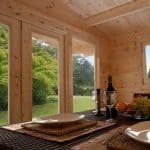 We’re used to seeing thick wall cladding on the log cabins that we review, but even so we were impressed by the 34mm thick logs used here. That’s thicker than average, and they gain extra toughness by being fully planed and because of the fact they’re made from durable Norwegian Spruce wood. They lock tightly together, and so are very effective at keeping rain and snow out, so you won’t have to worry about keeping your contents dry. Also locking tightly together is the floor, as just like the roof it’s made of high quality tongue and groove timber. Both the floor and roof have a thickness of 19mm, which once more is slightly thicker than we often see. One result of this is that you’ll be able to put heavy objects including furniture inside without having to strengthen the floor. We were very pleased to see that all the timbers had been subjected to a pressure treatment process. This means that wood preserver is forced under pressure deep in the wood. It gives long lasting protection and means that the customer doesn’t have to treat the wood themselves every year, although we still recommend inspecting it on annual basis. With such thick cladding and such long lasting preservative protection, we would also have expected a long manufacturer’s warranty to be provided, but unfortunately no extended warranty against rot is given. The double doors are possibly the standout feature in our opinion. 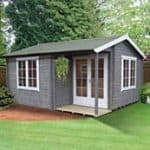 They’re large and accommodating, with a width of 1.40m and a height of 1.83m, which is very important for a garden building that may have large items of furniture placed inside. They are also fully glazed, which is one of the reasons why the interior is so bright. There’s lots of glass on display here as there are three large windows. They all open outwards, using a safe tilt and turn mechanism, to allow fresh air in and they’re also double glazed just like the doors. This double glazing means that when the windows are closed hot air is kept inside rather than escaping, and the effect of outside noise is reduced. It was good to see that the doors as well as the windows had double glazing, as this creates a tougher barrier for intruders to get through. In today’s climate, every deterrent can prove useful. We would have liked to see a secure locking system included as standard, however, as although there is a mortice lock on the doors it will need a padlock to be fitted to it to make it secure. The above mentioned padlock will have to be bought separately, although they can be bought for ten pounds or less. 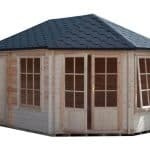 Rather more expensive, at £599, is the professional installation service that can be purchased with this log cabin. 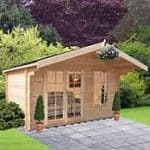 Whilst we think that two people can easily put this cabin together themselves by following the instructions, even if they don’t have a lot of DIY experience, we can imagine this proving popular among people who don’t have the time or confidence for a large self-assembly project. We were pleased to see signs of high quality components and construction throughout this building, as demonstrated by the use of thick and planed Nordic Spruce logs. The initial pressure treatment provides long lasting protection for the cladding, although we would have liked to see this backed up with a long warranty as well. 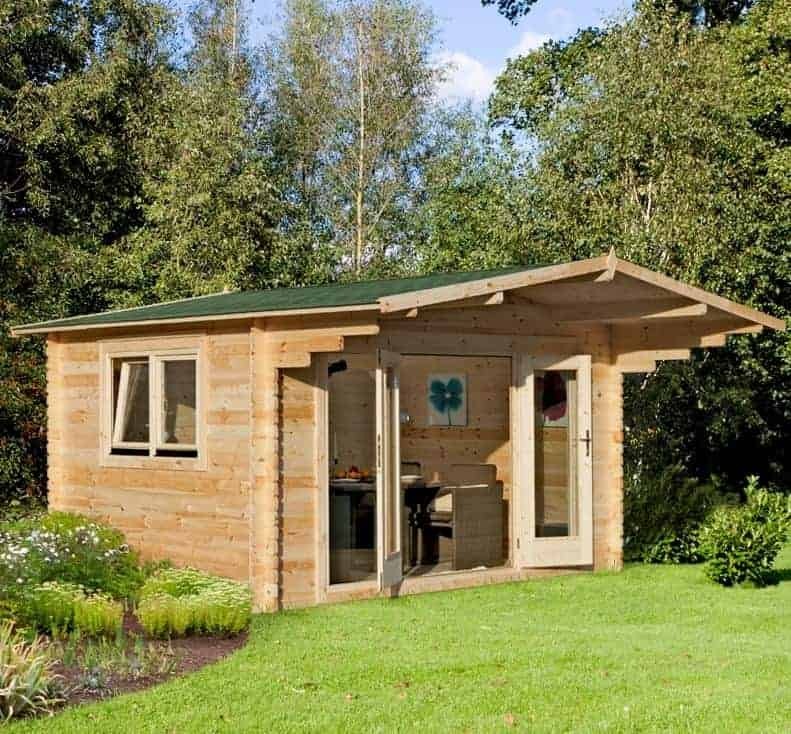 This is a mid sized log cabin, but extra space outside the building can be used thanks to more than a metre of overhanging roof. The size of the building means that you and a friend should allow at least a full day for the installation, but it was good to see that all fixtures and fittings are included. For such a well designed log cabin with lots of attractive features, we feel that this represents good value for money. 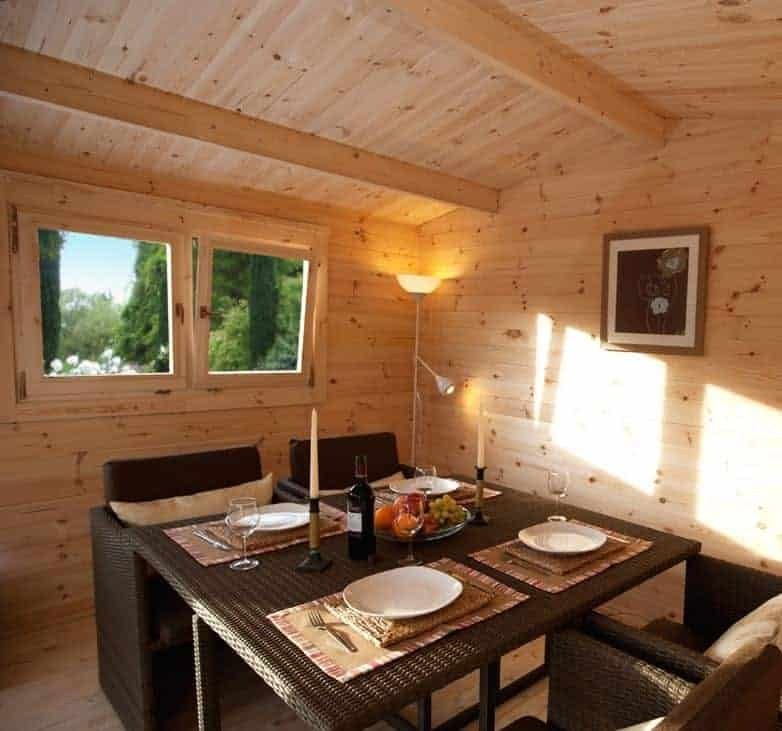 Final Thoughts: This log cabin stands out from many others that we review, for all the right reasons, thanks to the tall and long overhanging roof. It makes an already versatile building even more flexible, and we can picture the covered area at the front being used to entertain guests on a summer evening. There’s a lot to like about this cabin, from the profusion of double glazing to the thick rain repelling cladding. We would have liked to see a long warranty period provided, but this building still has very good waterproof qualities and so is likely to prove resistant to rot.